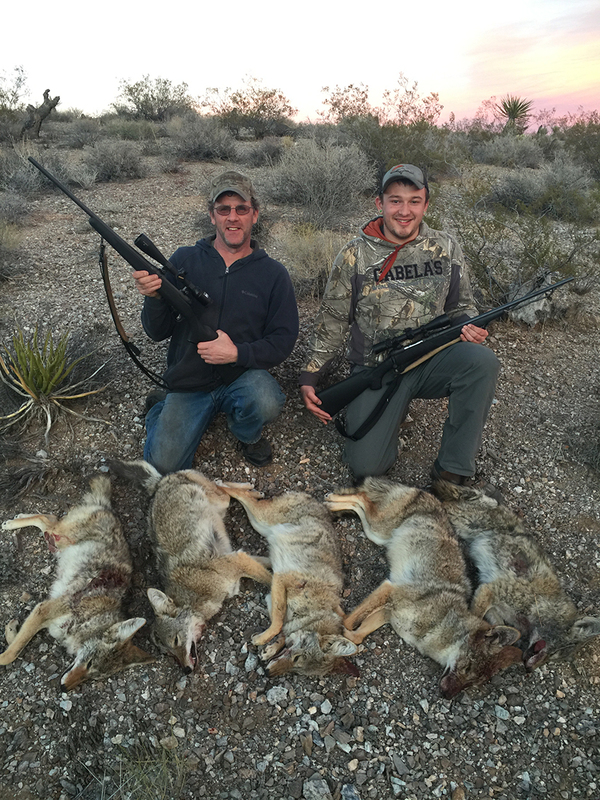 Mark & Matt came out from Michigan for a guided coyote hunt in Arizona. Coyote calling is without a doubt one of the funnest & most challenging hunts in the world. Coyotes are known for being crafty & very adaptable. They approach the call in many different ways, from circling the down wind at a mile, to sometimes attacking the call, even if it means jumping into a cactus. In the desert Southwest (Arizona), coyotes can be found almost anywhere, especially during the winter months as water becomes less of an issue & the pups disperse into new territory. On our guided coyote hunts we are hunting elevations from sea level all the way up to 6,000 ft in elevation. Typically speaking, the temperatures vary from 15-40 degree lows to 30-70 degrees for a high. 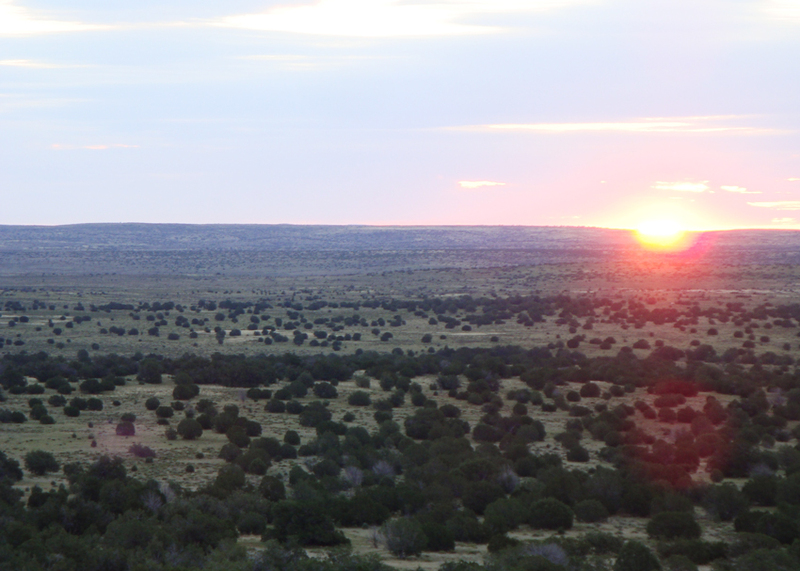 The geography & topography change from desert rock formations, creosote/grease wood flats, to thick juniper country. Going on our guided coyote hunts are often compared to going on a Safari, because of the amount of country we cover in our 4×4 vehicles, as well as the anticipation of what’s going to be around the next bend. When you specifically come out to Arizona for one of our guided coyote hunts, we will be trying to make as many coyote calling stands as possible. We pick hunters up from their hotels before daylight & then drive 30 minutes to 1 hour+ to get to areas we feel will produce the best results. Typically, the coyote calling stands/set-ups are 10-15 minutes, but some times we will decrease or increase the amount of time on stands based on our experience. Coyotes will often come into our calls as singles looking for an easy meal, but we have called in as many as 5 on 1 stand with guided hunters. Coyotes will respond to many different sounds & typically approach because of hunger, curiosity, &/or territorial issues. How many coyotes do you call in on your guided coyote hunts? We are hunting wild animals so the results typically vary because of a number of factors. On average, we call in 3-6 coyotes per day, but we have called in as many as 13 coyotes in one day with clients. Weather & stand location often dictates how well a day of calling coyotes produces, but a number of hypothetical scenarios also have an impact on a coyote hunter’s success. Ian Chappel came out from Pennsylvania for his guided coyote hunt. What’s the success rate on your guided coyote hunts? It varies, but on average it is about 40-50% of the coyotes we call in get taken. This number increases to 55-70% with returning clients. 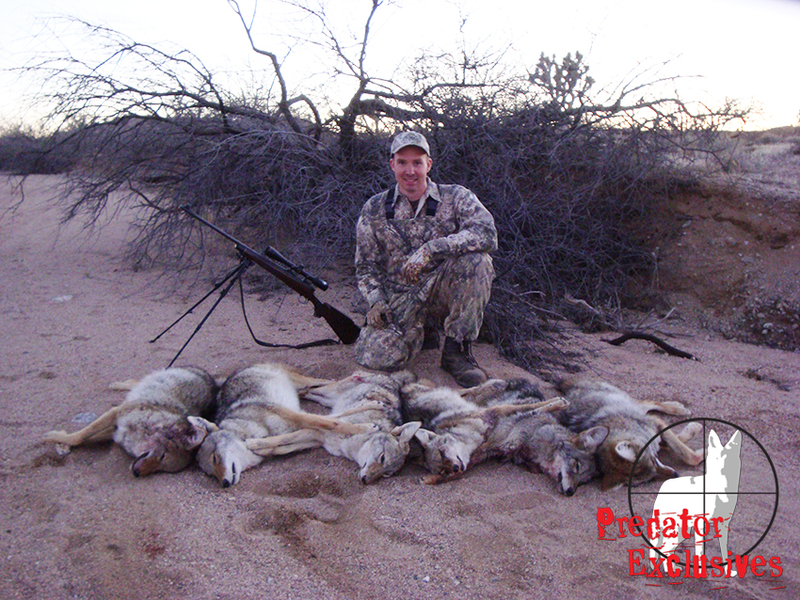 Hunters often don’t understand how unpredictable, quick & small of a target coyotes are. You can’t replicate or teach experience, it must be learned, so once hunters understand what coyotes look & act like in the terrain we hunt, hunters are able to make adjustments. Double check zero on rifles during the hunt. Always have scope on lowest setting at the start of the stand. Shoot from Bipods & Shooting Sticks while sitting. Bipods less than 27 inches will not work on elevated stands. Get extensions or bring tall shooting sticks. Shotguns WORK! Often, hunters only want to shoot rifles, only to realize a shotgun shooting #4 buck w/ tight choke would have made life much easier. Don’t get discouraged after you miss, it happens to everyone. Take a deep breath & squeeze the trigger. Listen to your guide, it’s our back yard & we have been doing this for 20+ years. Here is a good read on Coyote Calling Myths , which will also help mentally prepare you for your guided coyote hunt. What else do you call in when hunting coyotes? By targeting coyotes, it doesn’t mean that is all we will call-in, although we do see increased success rates by focusing on a given species. Bobcats & coyotes core areas do overlap, so we have called in several bobcats while trying to call in coyotes. Kit fox, grey fox & badgers have also approached our calls while trying to call in coyotes. 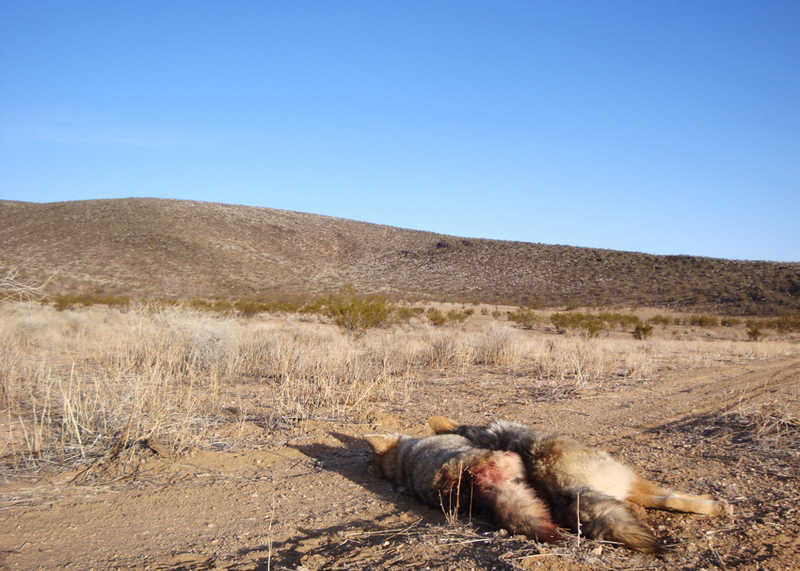 For pricing & logistics for our guided coyote hunts click/tap here. For more information on all of our predator hunts click/tap here.